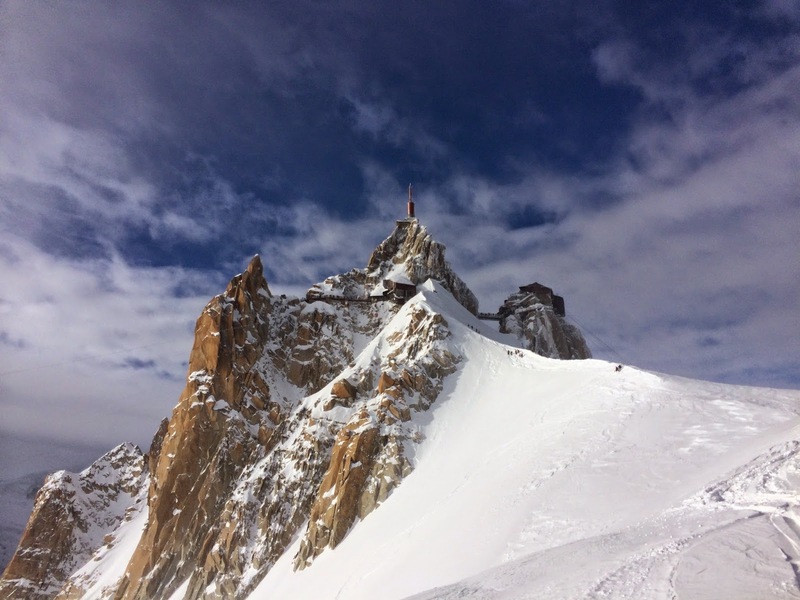 The Aiguille du Midi in Chamonix, France is one of the most famous lifts in the world. It holds the record as the highest vertical ascent cable car in the world, as it brings you up to 3842m (12,605ft). After passing through the famous ice tunnel, and making it down the arête, you can ski a variety of big mountain descents through heavily crevassed and unmarked terrain. Unless you are 100 percent confident in your glacier and ski mountaineering skills, it is wise to hire a local guide. 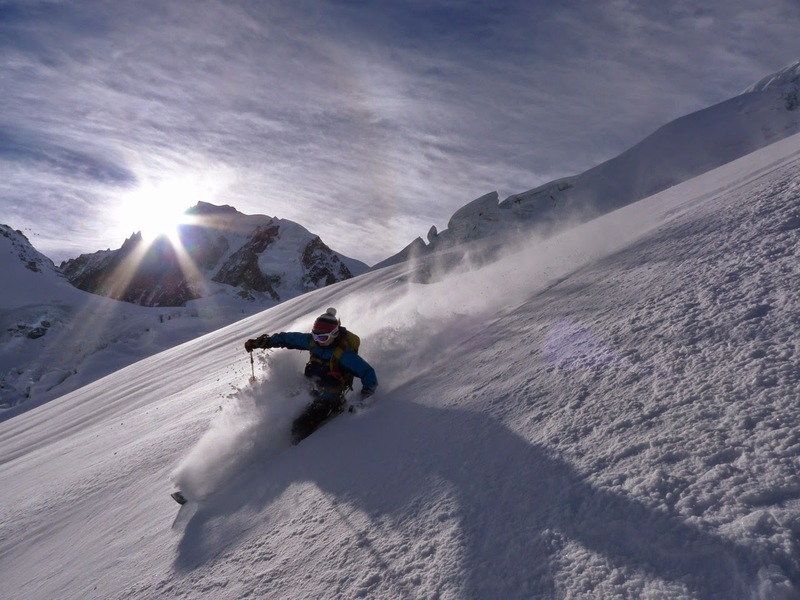 When you ski down to Chamonix, it is a 2807m (9,200ft) descent. The access gives you the ability to explore high mountain terrain with incredible ease that is hard to replicate anywhere else in the world. However, the access needs to be respected because in Chamonix you can go from drinking an espresso to almost killing yourself in less than 5 minutes. Be sure you are prepared. 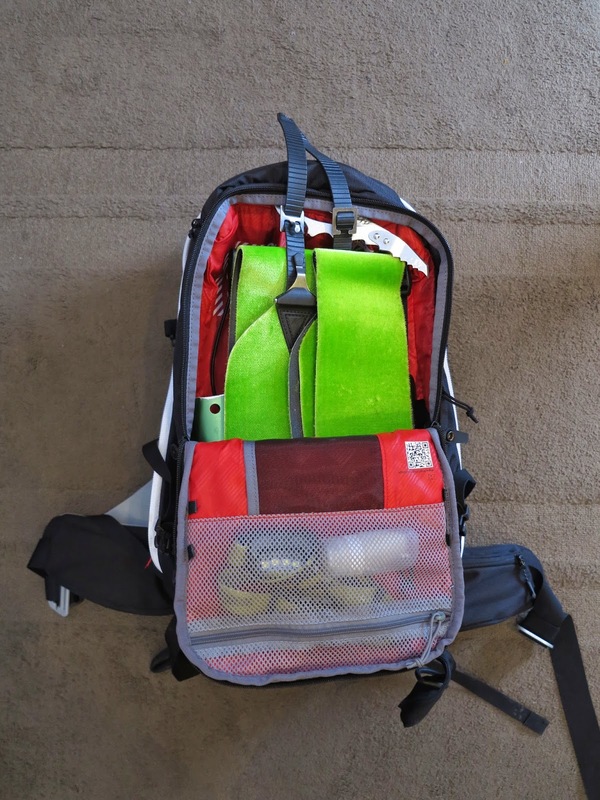 Here is a look at what I carry with me down a ski run off the Aiguille du Midi. Food: At a minimum I bring a chocolate bar. 30-40 meter rope: A lightweight half rope works great. Be sure to practice crevasse rescue to make sure you know what works on these skinnier ropes. I use the 7.5 Twilight. Mammut Pulse avalanche transceiver: The best on the market in my opinion. Metal shovel: Friends don't let friends use plastic shovels. My shovel handle is also part of an emergency rescue sled. Probe: In the heart of the winter, I don’t use a probe shorter than 300cm. Crampons: Getting down the arête can be icy. Aluminum crampons are light and do the job. Protect your other items by keeping them in a protection case. An old American mountain guide trick is to use a USPS priority mailing bag that is made out of Tyvek. Lightweight and free! Ice axe: I love my aluminum axe with the steel pick. Keeps the weight down. Skins: Gives you options for objectives, and for emergencies. Smart phone: App for the French topos, which functions as my GPS. Mammut Pro Short Removable Airbag 33L Pack: In Europe, a different canister is used than in North America. Leave your canister at home and rent one at the Chamonix Mammut shop. Bonus, the European canisters are smaller and lighter. Stack of gauze—need enough material to stop a major bleed. Arguably the most useful thing you can carry in your first aid kit in the mountains. Long ski straps. Winter’s duct tape. If you have nothing else for repair, be sure to have a few of these. Real screw driver. The mini-ones don’t work well with Dynafit bindings. I find the weight of a real screw driver is worth its weight. Pole basket. It would be a long push out of the Mer de Glace with a missing basket. Extra batteries. Could be used for my headlamp or transceiver. Lightweight bag. This is the case from my Zephir Altitude Harness. Utilize the “Wet Room” of the pack by keeping your shovel, probe, and skins together. Fit your axe in there as well. Nothing worse than getting crammed into the tram and having to worry about stabbing someone with your axe on the outside of your pack. Keep sharp items protected or away from your airbag. A well packed pack should have the weight evenly distributed, and then snugged together so the items don’t toss you around. Avoid having anything on the outside of your pack when possible. I've noticed that an ice screw seems to be a fairly standard item for glacier travel in the Alps, but I have been chuckled at for carrying one in the Pacific Northwest. Can you elaborate on its uses in glacier travel and differences in snowpack or crevasse formation that would influence your decision to either bring it or leave it at home? I always imagined it being useful for anchoring yourself to the wall of a crevasse while your partner builds an anchor on top. Thanks for the great question. You are correct, an ice screw is a standard item for glacier travel. I carry one with me almost always when traveling on a glacier, whether in the Alps or in the Cascades. It could be used in a variety of ways, including anchoring yourself to the wall of a crevasse while your partner builds an anchor up top. Or you might also find use for it on the surface of the glacier in case you end up somewhere unexpected. I have a V-thread tool with me as well which makes it even more useful. Ahhh yes, tyvek in the backcountry = advanced move.